I have thoughts...lots and lots of thoughts. You can read, lots and lots of thoughts. Therefore, Blogging exists, I type, you read. You read therefore I type. Even if you dont read, I type. I TYPE. I am in Awe. I am in awe of one woman who stood and spoke for 13 hours in support of women's rights in the state she represents. 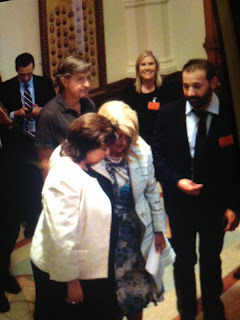 I am in awe of another woman who left her father's funeral to hold her colleague's hand, support her through a grueling filibuster, and lend her voice to the fight for a woman's right to her body in the state of Texas. You see, it's easy for me to rant and rave on facebook. It's easy for me to get angry, and agitated over news while I watch at home on the tv or read on my laptop. It's easy to talk about these things that concern me on whatsapp, and angrily type out a comment on a particularly bothersome story. But what Senators Wendy Davis and Leticia Van de Putte did is hard. I'm not talking about the ordeal of standing for 13 hours straight. I'm not talking about the fact that not only did she plan to filibuster for 13 hours, but she also had to speak on topic lest she be ruled out of order for not saying things that are germane to the debate (which by the way is why she had to stop just shy of her goal - she was ruled out of order 3 times). I'm not talking about the fact that Ms. Van De Putte had to leave her father's funeral early to help her colleague and the women of Texas achieve what must have seemed impossible at the time. I'm talking about all the other things that do not lie in their hands. Today I am grateful to Senators Davis and Van de Putte for doing what takes tremendous courage, and strength. To drown out those voices of paternalism and misogyny with one day of fortitude is no mean feat. My heartfelt admiration to the two of you and tremendous thanks to the women of Texas who showed up. Because of you there is still hope. I was watching the live telecast, and only one word came to my mind. SALUTE. And also to the people of Austin who showed up and started a "people's filibuster" when those old GOP cronies tried to stop her on a totally inane point. They'll be back. But she will go down in history as the change agent of the women of Texas. I normally write when I get worked up about something major - although Im trying to change that, and hopefully I will write more often now.